Our stainless steel railing systems are available in a Type 304 stainless steel and Type 316 stainless steel. Type 316 stainless steel has a higher nickel content in the composition of the material so the result is a higher resistance to corrosion compared to Type 304 stainless steel. We recommend using Type 316 railings systems when higher corrosion resistance is necessary such as coastal regions around salt water environments or railings adjacent to pools or other aggressive environments. Our Type 304 railing systems are a cost effective solution to the Type 316 stainless steel and are suitable for indoor applications or areas that are not subject to such aggressive environments. All of our stainless steel railings systems come standard with a #4 brushed satin finish but other finishes are available. 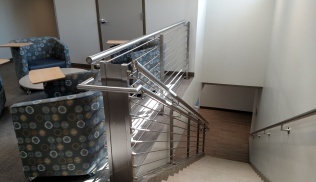 In addition, all of our stainless steel railings systems lend themselves to LEED projects for designers looking for an environmentally sustainable railing system with a 100% recycle ability. 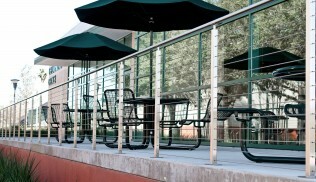 Seco South also offers aluminum railing systems as an alternative to stainless steel. 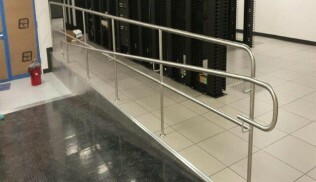 Our aluminum railing system offers a cost effective solution to the stainless systems and these systems are available in a variety of colors using a powder coated finish. We offer a variety of pre-engineered systems that can be shipped nationwide and installation is available. We encourage designers to contact us with their custom designs or even if they just want to make some simple modifications to our pre-engineered systems. We have detailers on staff that can provide customized drawings to design professionals to imbed in your projects as well as full specifications for all of our systems. Bridges and Overpasses – Many bridges and overpasses require salt for deicing purposes during the winter. The corrosive resistant properties of stainless steel cable railings present the best answer for walkways on bridges and overpasses. 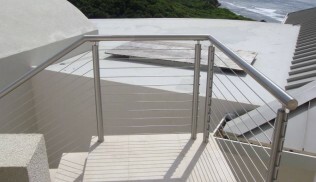 Coastline and Other Humid Areas – The corrosion resistant properties of stainless steel make these cable railings ideal for balconies, decks, stairwells and walkways along the coastline, in humid mountain areas and southern states. 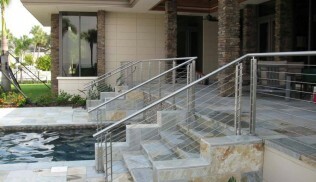 The stainless steel cable railing systems are an excellent solution for poolside safety. 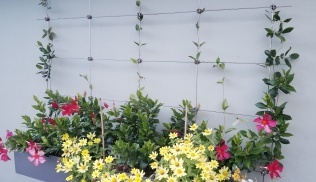 Exterior Applications – Stainless steel has a chromium layer that reduces the risk of rust in outdoor settings. 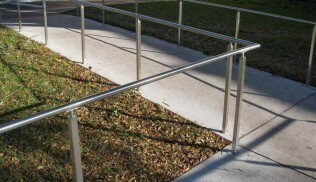 Stainless steel cable railings are a durable product due to its high strength. 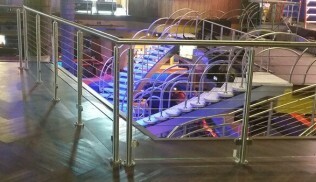 Fencing – Cable railing systems made from stainless steel works great for many fencing applications including zoos. 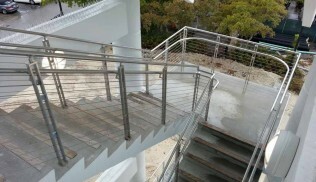 High Traffic Areas – Stainless steel cable railing systems maintain an aesthetically pleasing appearance year after year, even in high traffic areas. Industrial Aesthetics – Architects love the appeal of stainless steel cable railing systems for loft apartments, factories and warehouses. Interior Settings – Stainless steel cable railings are aesthetically pleasing for residential lofts and modern home decor. 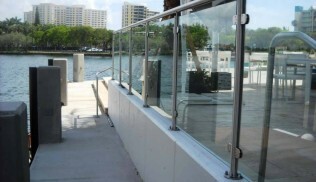 Marinas – The salt and water resistant properties in connection with the high strength of stainless steel cable railing is a perfect match for marinas. Near Chemical Plants – Due to the corrosive properties in the atmosphere from chemicals near some plants, stainless steel cable railing systems are ideal. Sanitary Settings – Hospitals, rehabilitation centers, nursing homes, restaurants and food processing plants recognize the sanitary benefits of stainless steel. 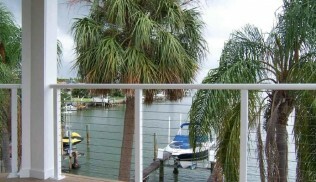 Views – Cable railing systems allow for viewing of the scenery, which is ideal for a New York high-rise, Tennessee Mountain chalet or a Miami Beach private residence. Please contact our sales team with any questions you may have and we look forward to providing Seco South railing system on your next project.